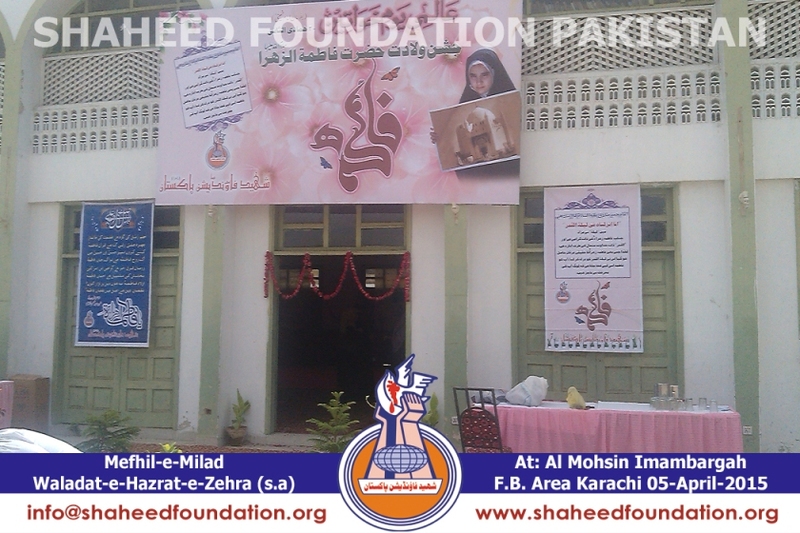 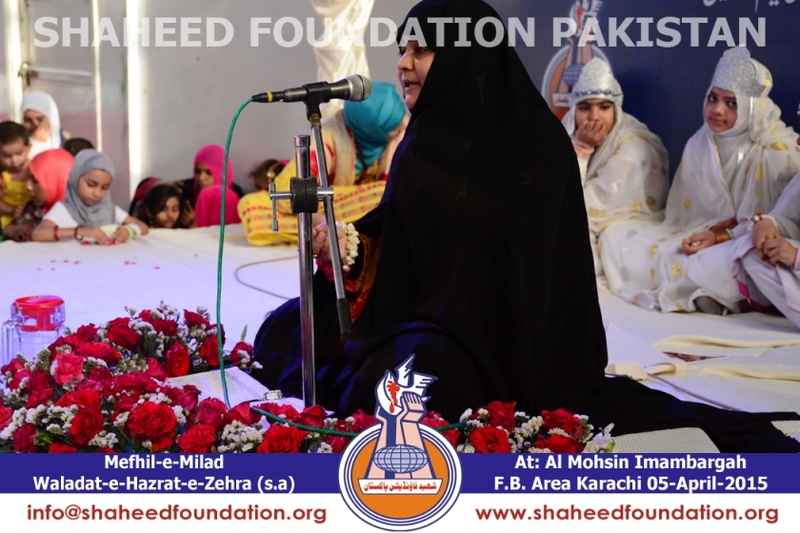 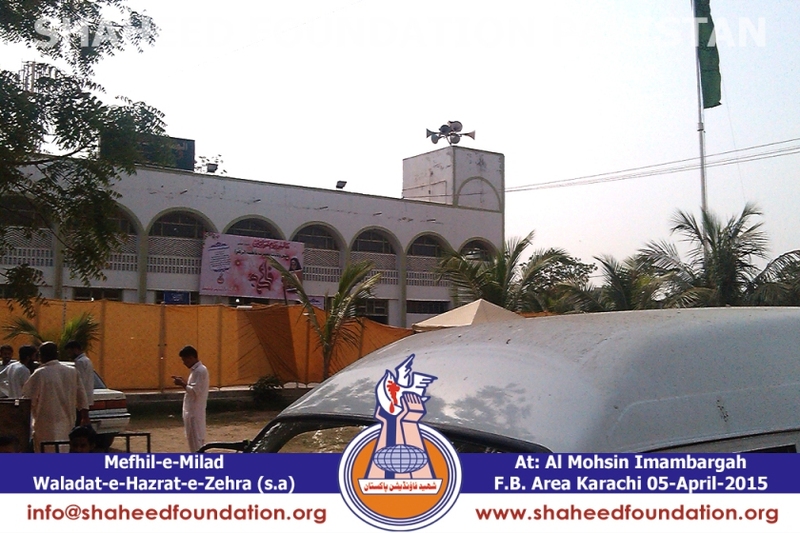 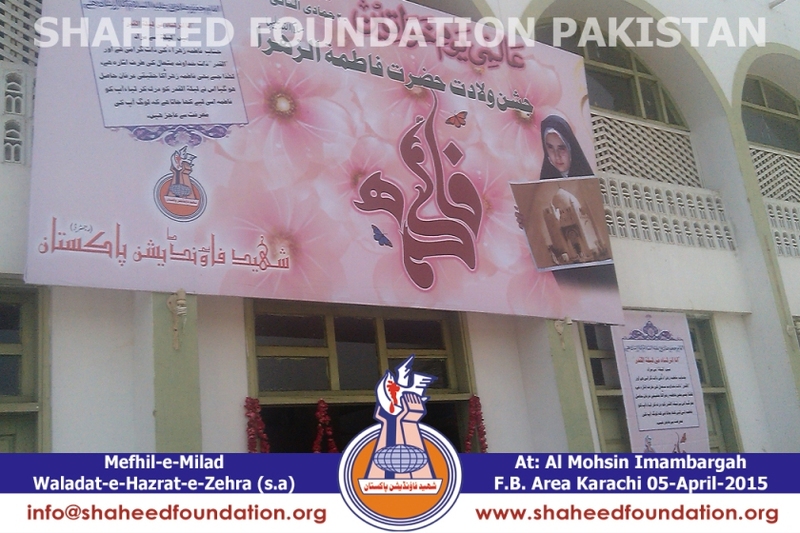 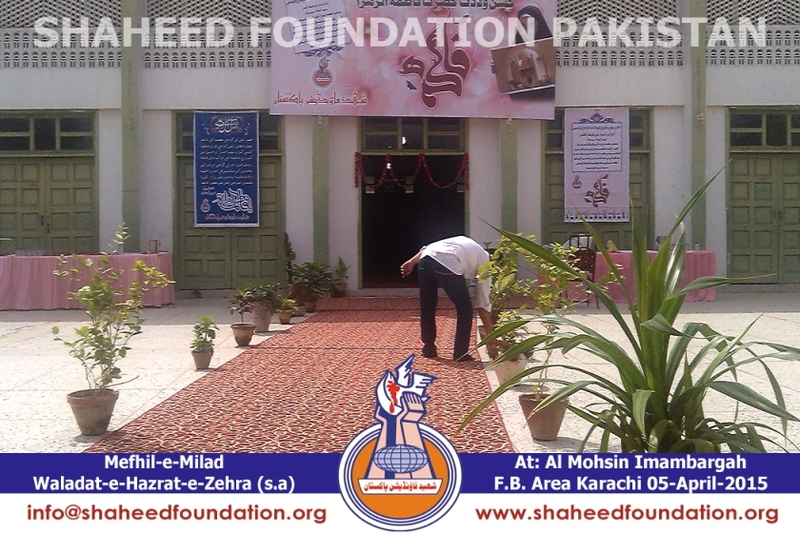 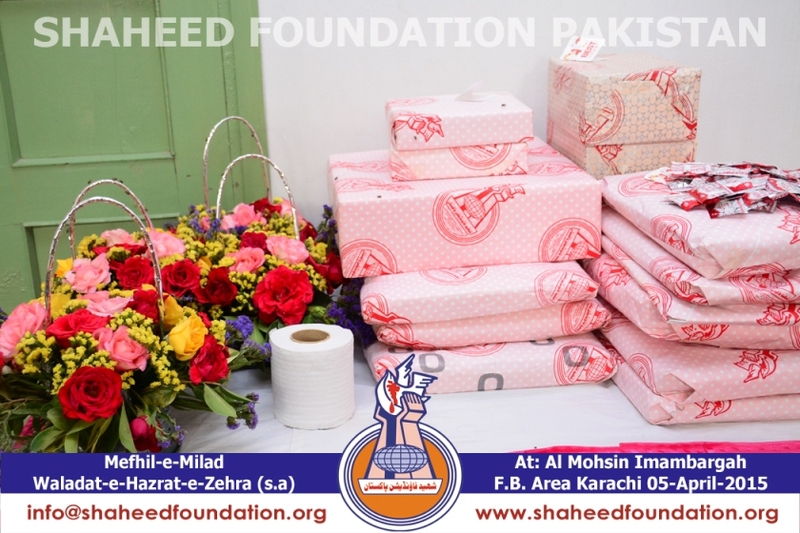 Shaheed Foundation Pakistan organized a solemn annual program to pay homage to the revered personality of Sayyida-tu-Nisa-il-Alameen ,Fakhr-e-Maryam[AS],Markaz-e-Panjtan[AS],Hazrat-e-Fatimah Zehra [Salaamullaah Alaiha] on the blessed occassion of her birth anniversary in the sacred month of Jamadi-al-Sani . 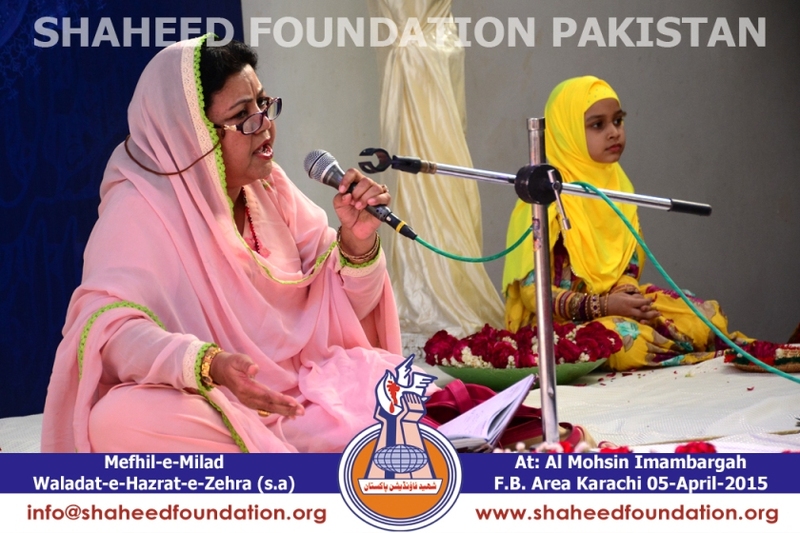 The program was convened on 5th April 2015 at Al-Mohsin Imambargah located in District Central of the megapolis in the week preceding the holy birth day and was attended by ladies ,children and daughters from the families of the beloved martyrs of Millat-e-Jaffaria Pakistan. 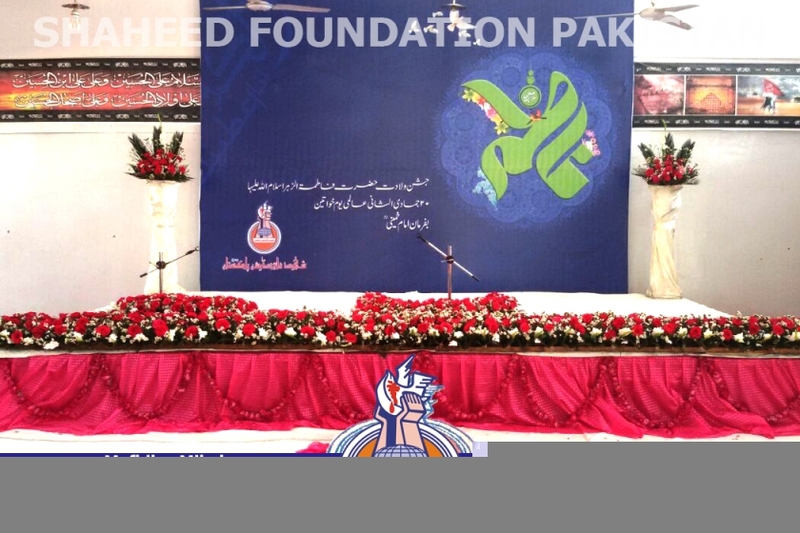 Painstakingly efforts were taken to start the program on the dot at 3pm,due to extreme cooperation of participants in this regard. 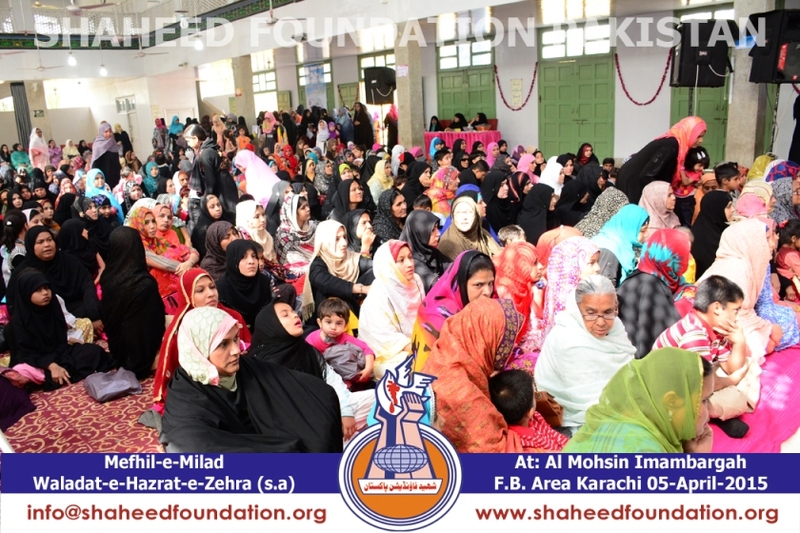 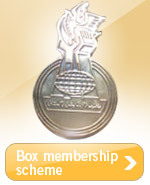 An important purpose of this ladies specific program is to allow the ladies,children and daughters from martyrs' families to express themselves so that they can confidently utilize their capabilities and draw inspiration from the Holy Personality of their Roll model ,the Lady of Heavens and Earths, Hazrat-e-Fatima Zehra [Salaamullaah Alaiha]. 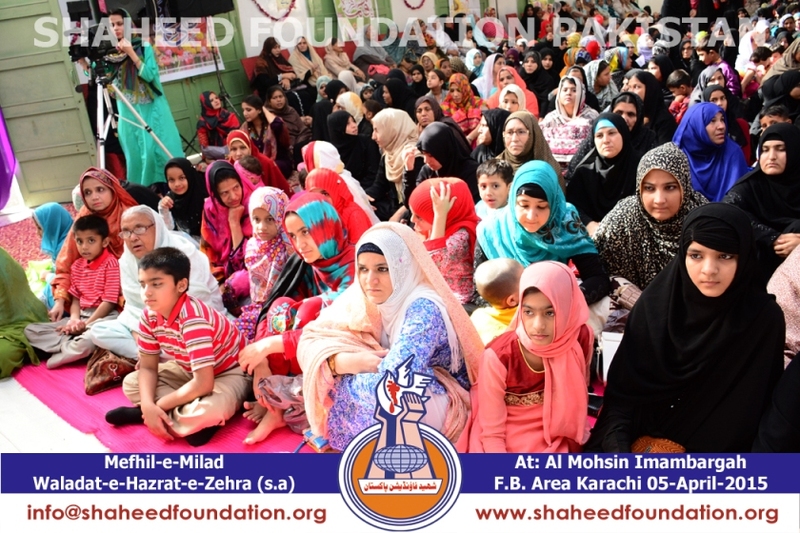 Imam-e-Raahil Imam Khomeini [RA] considered that no occassion could be better than this day to be marked as the international women's day and hence it is commemorated across the entire world by the lovers of Ahlul bayt[AS] with the same spirit . 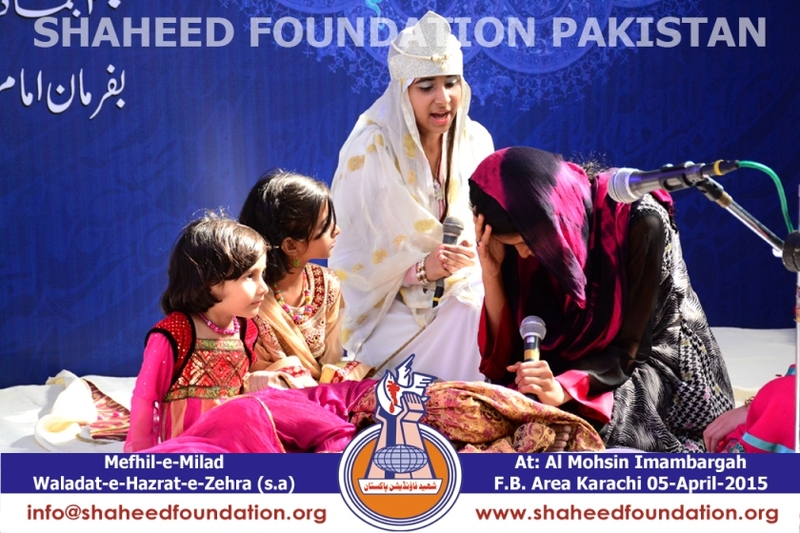 Shaheed Foundation Pakistan has begun to organize this program on an annual basis now as it provides a perfect rallying occasion for all ladies of martyrs' families . 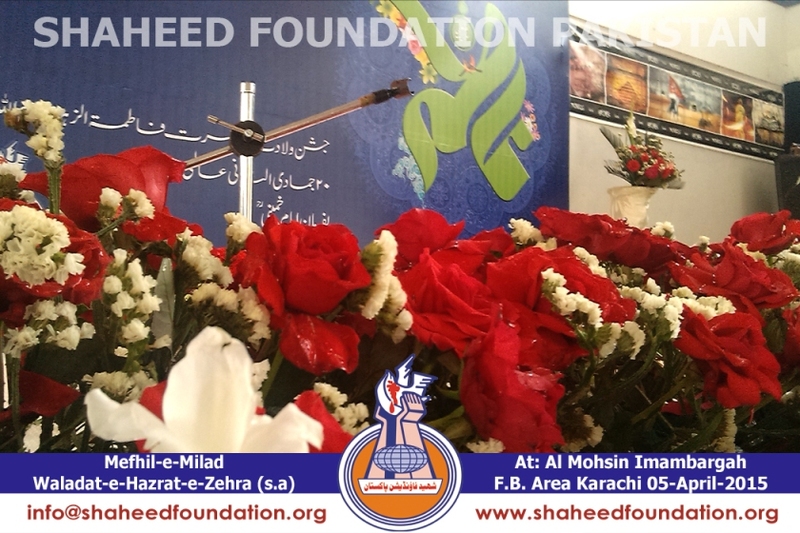 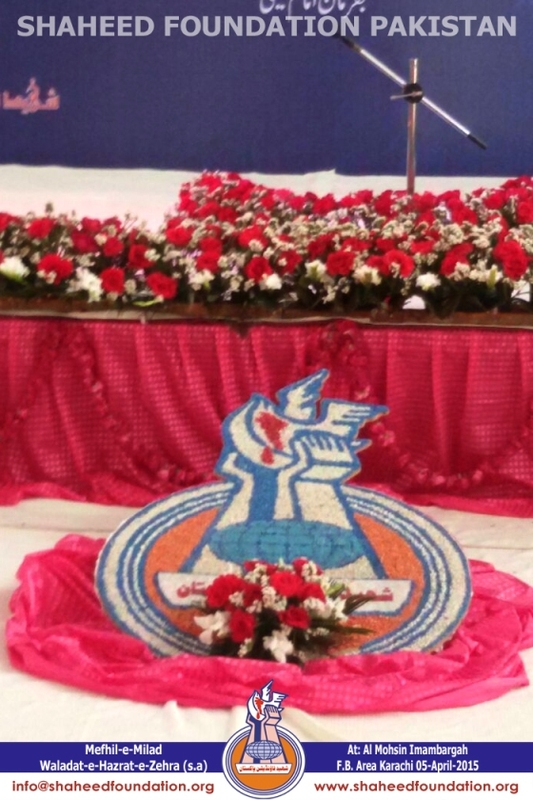 The program hall was beautifully decorated on the occasion with penaflexes inscribed with quotations fitting the occasion while the stage was adorned by flower bunches in a neat and attractive manner . 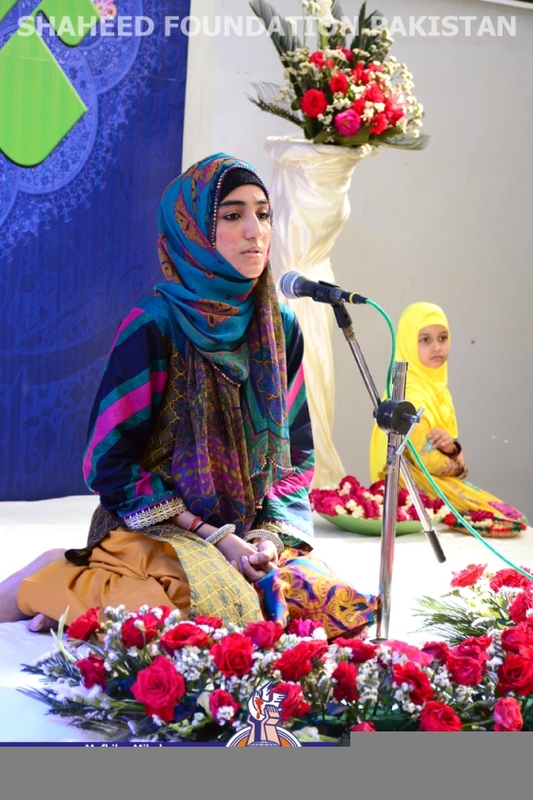 This year's program was slightly altered to accommodate more interesting ideas like the tableau based on events on the life of Hazrat-e-Fatima Zehra[Salaamullaah Alaiha] as these tableau performances leave a stronger and impressionable impact on the audience on long term basis and helps them draw lessons even later on. 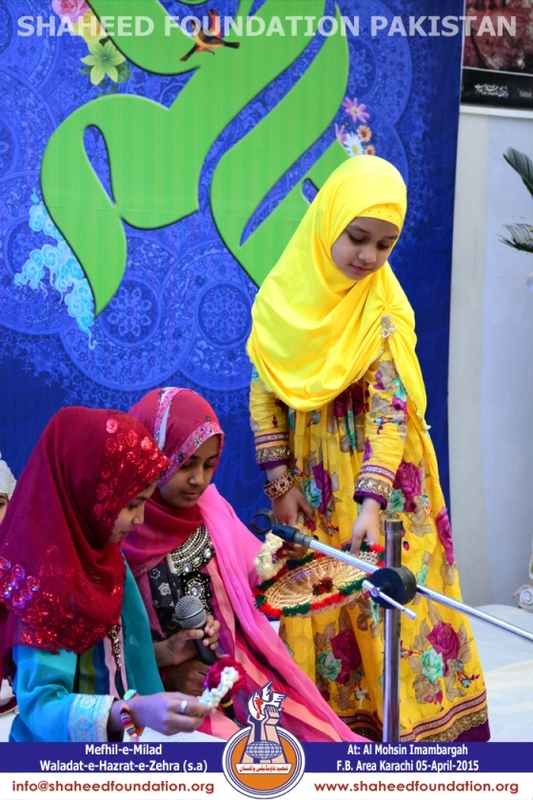 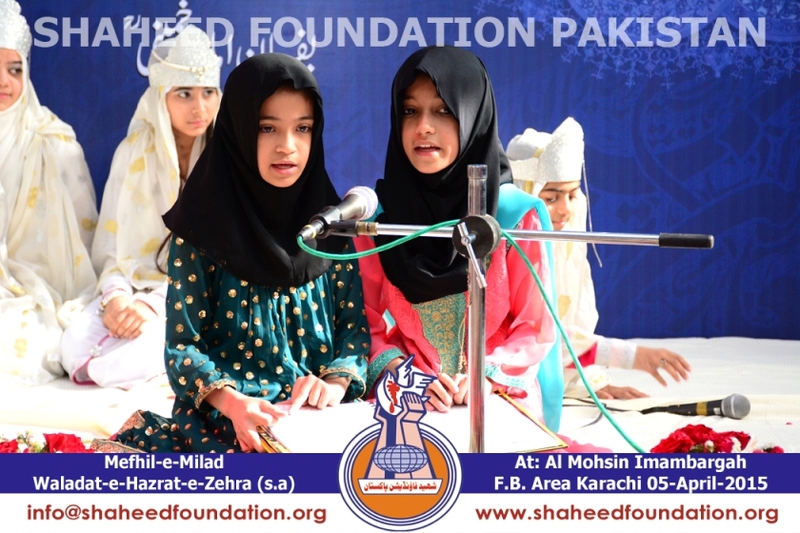 Ladies representing Zone 1 recited Hamd ,Naat and Script based on Dua-e-Sayyida-e-Fatima [SA] while those representing Zone 2 participated with Manqabat ,Speech and Script based on Dua-e-Sayyida Fatima [SA]. 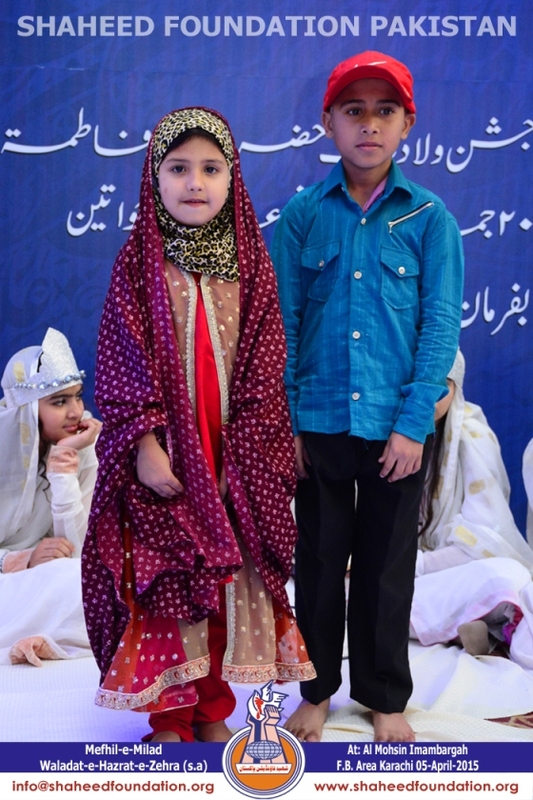 It was heartening to see the emphatic participation from little kids especially from zone 3 where from daughters of martyrs Jafar Hussain and Muneer Hussain recited manqabats. 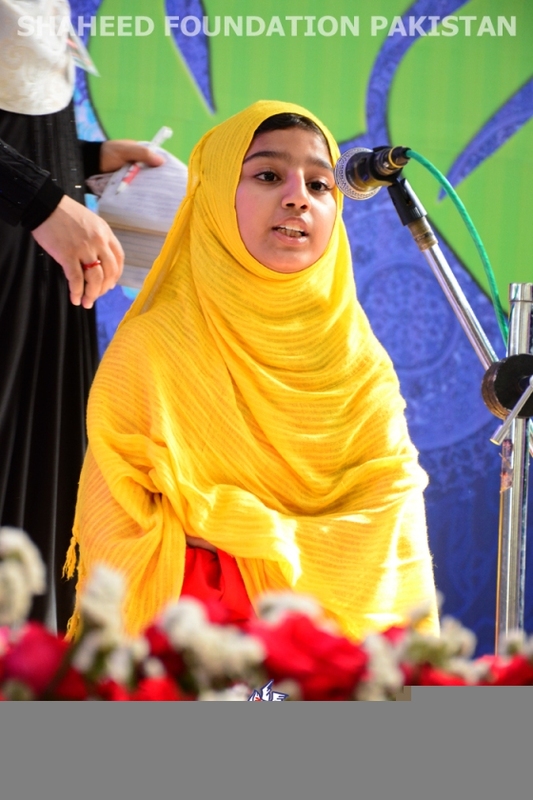 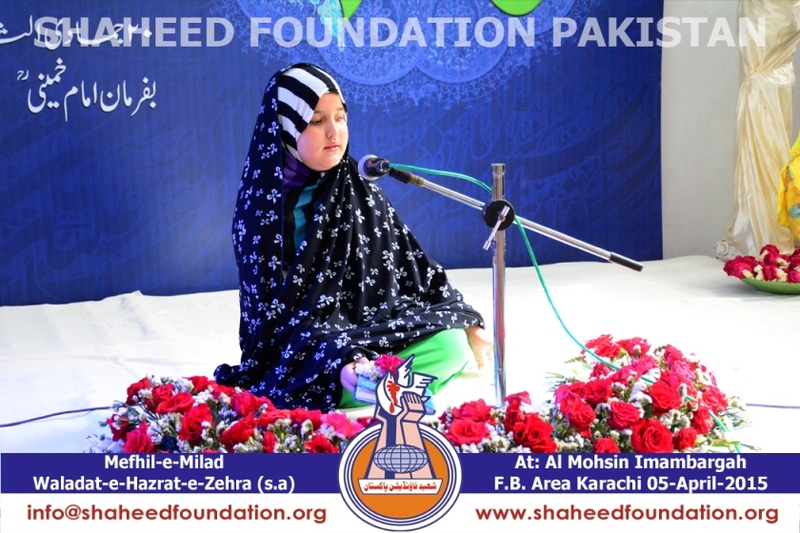 Spell binding speech of daughter of Shaheed Ahmed Ali Zaidi and a beautiful kalaam based on Naat-e-Rasool-e-Maqbool [SAWW] by daughter of Shaheed Chaman Ali remained the hall mark of Zone 4 participation . 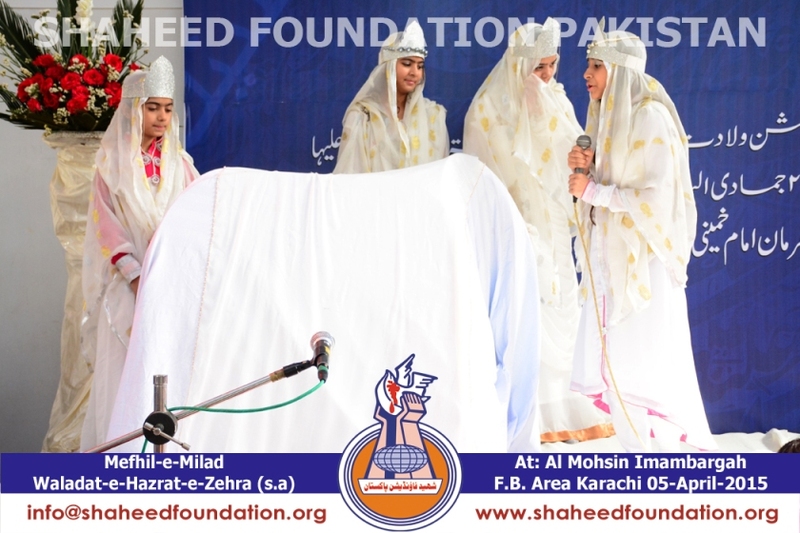 Ladies from Zone 5 shouldered the responsibility of beginning the program with the recitation of verses from the Holy Quran and recital of Dua-e-Imam-e-Zamana at the culmination of the program while Zone 6 presented a thought provoking tableau based on a Moajza of Sayyida-e-Fatima Zehra [SA] . 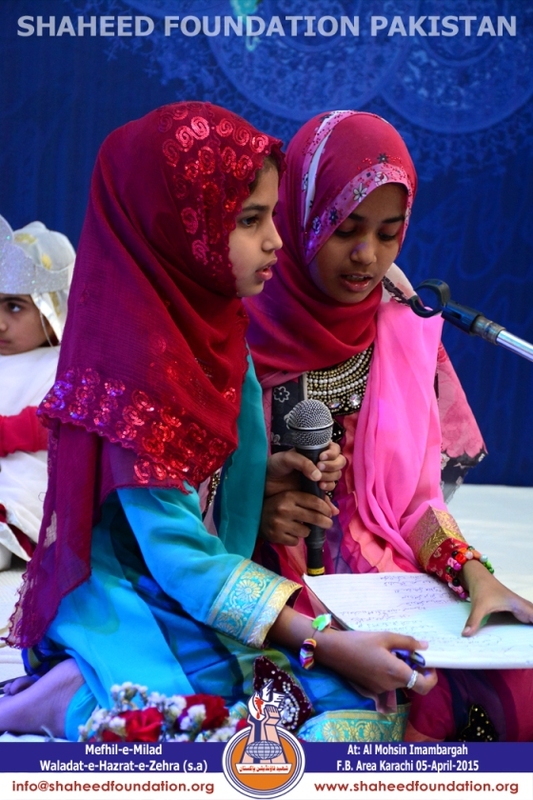 Renowned manqabat khawan ladies were invited on the occassion who recited the kalaams to pay tribute to Ahlul bayt[AS] . 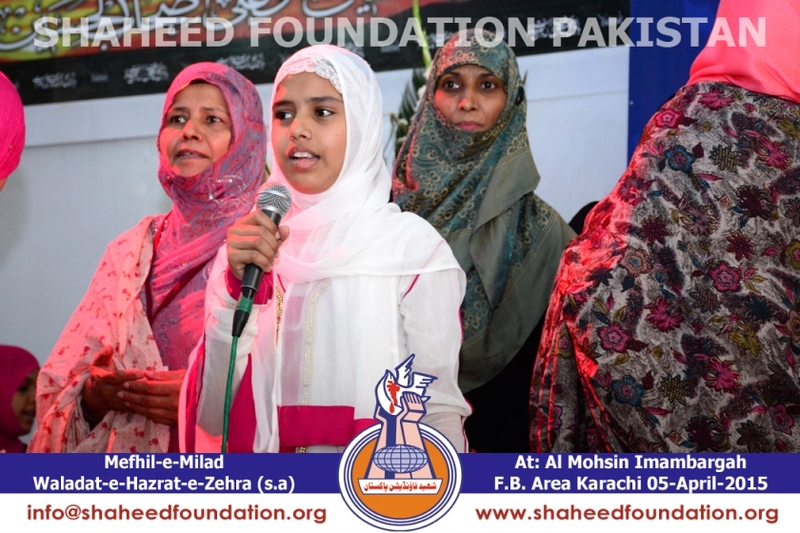 The martyrs' families ladies strongly appreciated Mohtarma Farzana Fatahyab sahiba who presented beautiful manqabat on the occassion and Mohtarma Uzma Zaidi sahiba who delivered a thoughtful speech . 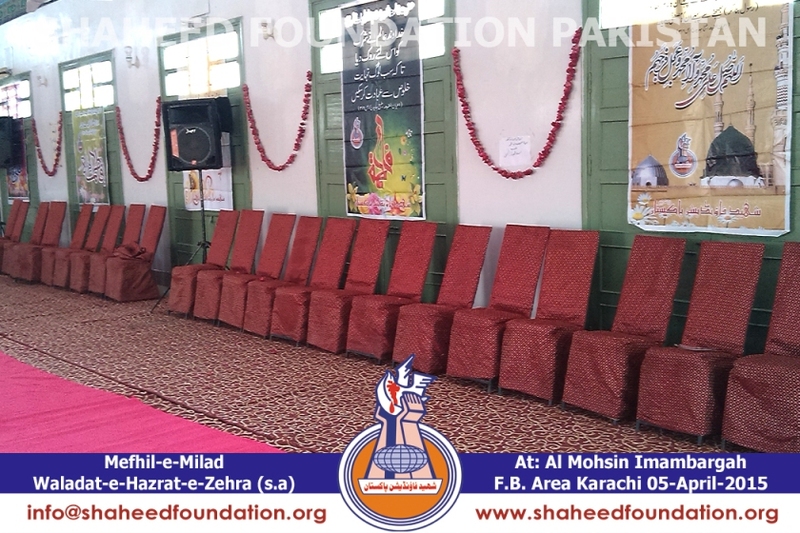 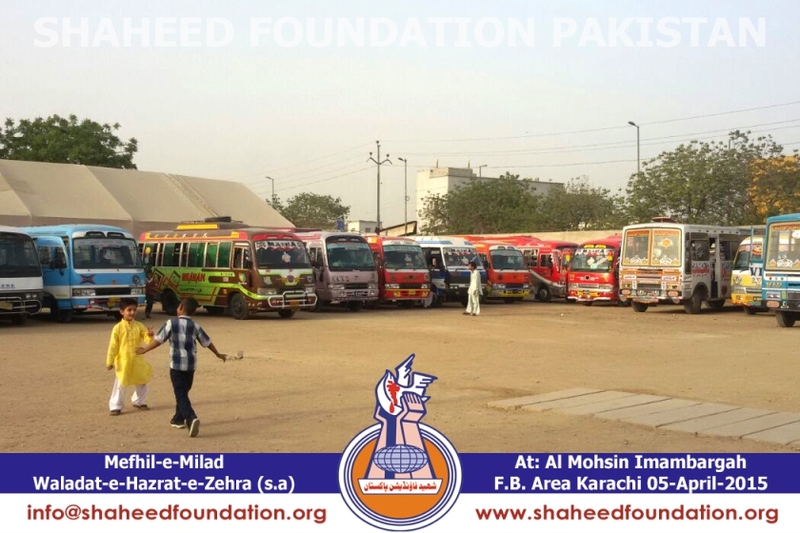 Another important aspect was the guest presence and key note speech of Ahliya-e-Mohtarma Shaheed Dr.Muhammad Ali Naqvi [RA] who had specially arrived to celebrate the occassion with Khanwada-e-Shohada-e-Millat-e-Jaffaria Pakistan ,Karachi and addressed the families on the occassion conveying her views in an articulate manner, empathizing with the blessed noble families who had sacrificed their beloved ones as martyrs . 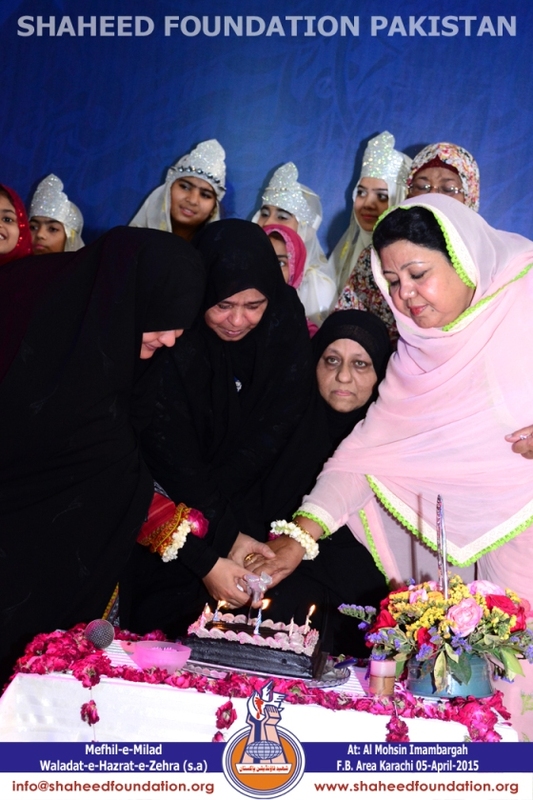 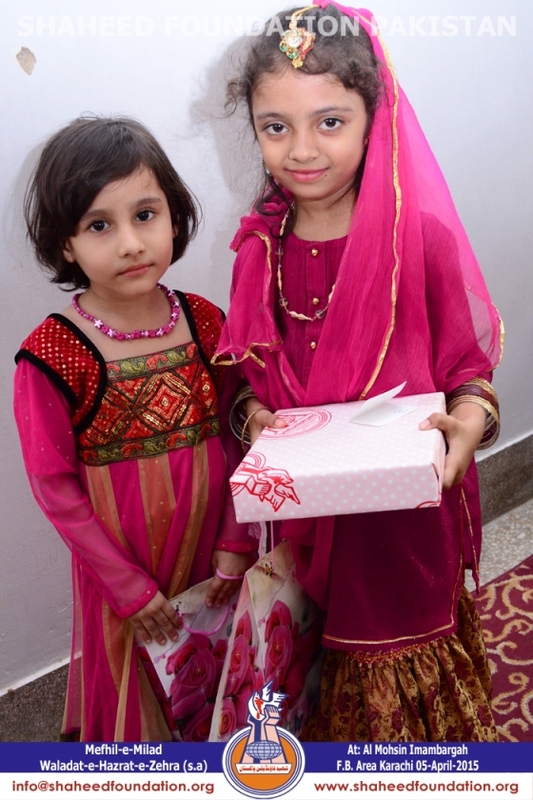 The program was concluded by a cake cutting celebration. 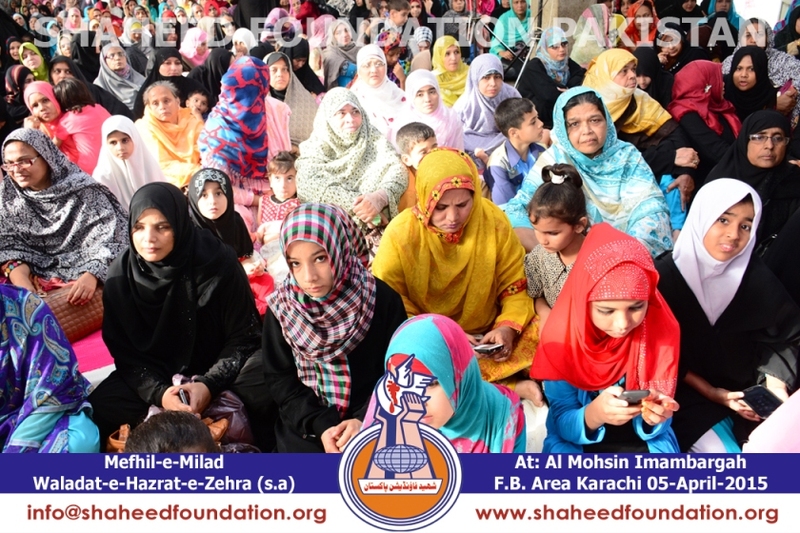 Since it was warm sunny day in the megapolis ,ladies and children braved challenging weather conditions and the volunteers tried best to keep the spirits up by continuously serving tabaruk ,sharbat and tea. 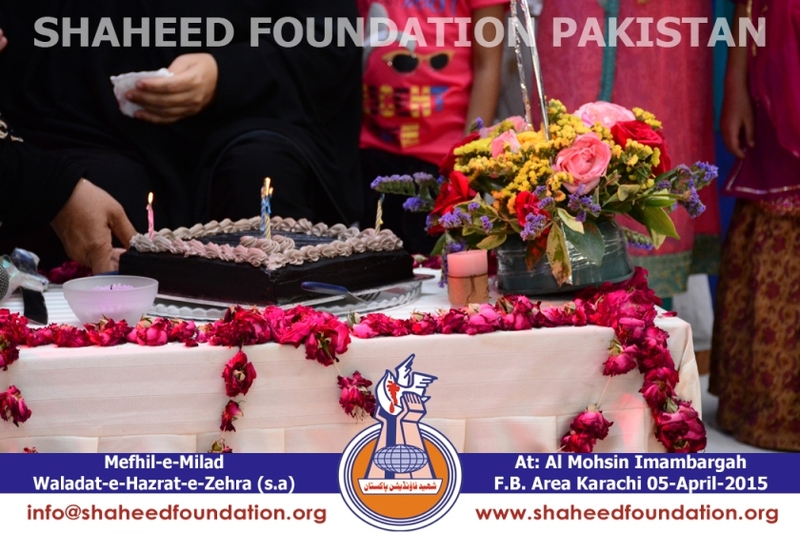 The program was administratively looked after by the ladies volunteer wings which comprises of ladies working members and volunteers from all zones in Karachi. 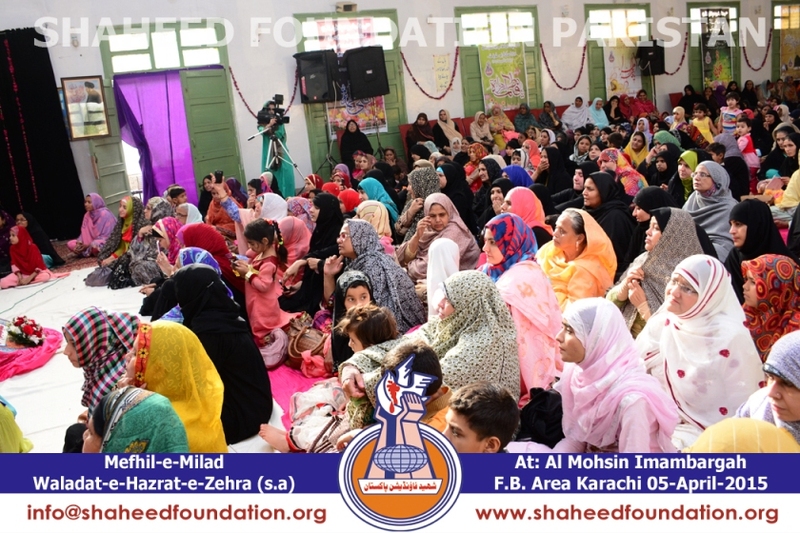 Besides ,Khanwada-e-Shohada some of the guest ladies were also invited and a strong and proactive participation of over 900 ladies made this truly all inclusive and vibrant program ,a real spiritual treat. 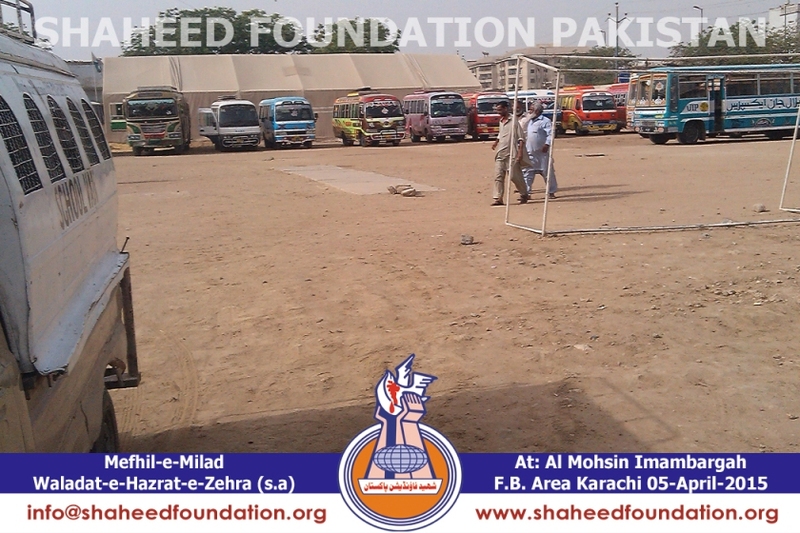 In this manner the program was managed extremely well and concluded well before maghrebain at 5:45 pm ,so that all families could easily and conveniently be transported back home,escorted by respective working members. 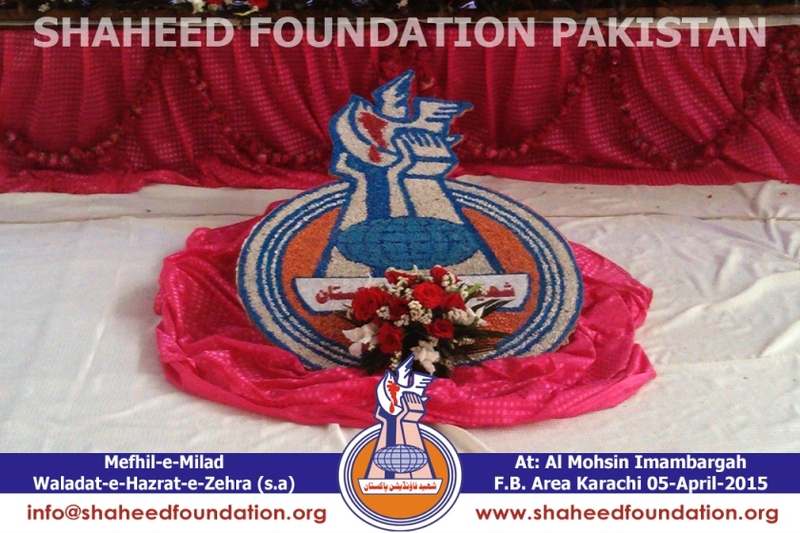 Shaheed Foundation Pakistan Central Committee extends its heartiest greetings and felicitations to the noble families of beloved martyrs ,working members from Karachi team , Ladies volunteers and every one who painstakingly undertook a lot of intense efforts to pay attention to slightest of intricate and minute details while chalking out the program and very wise implementation of the plan which brought smiles and cheers on the faces of children of martyrs. 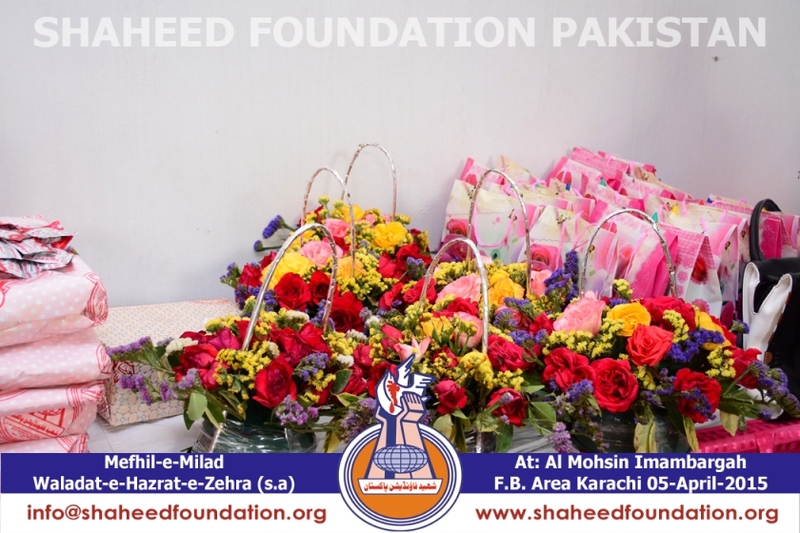 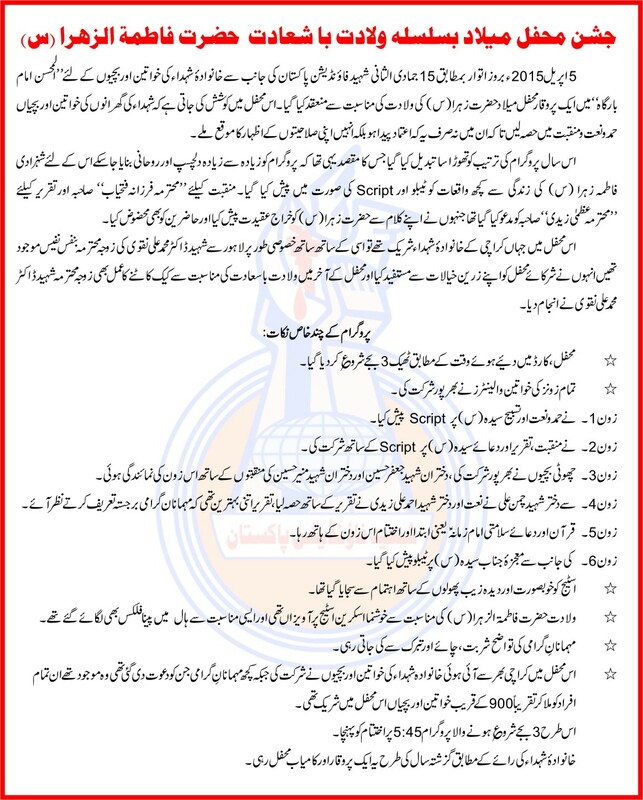 We beseech Her Majesty Sayyida-e-Fatima Zehra[SA] wholeheartedly to accept these imperfect but sincere efforts and bless every one who's been the part of this effort of serving the families of martyrs in any manner immensely with the highest jazaa . 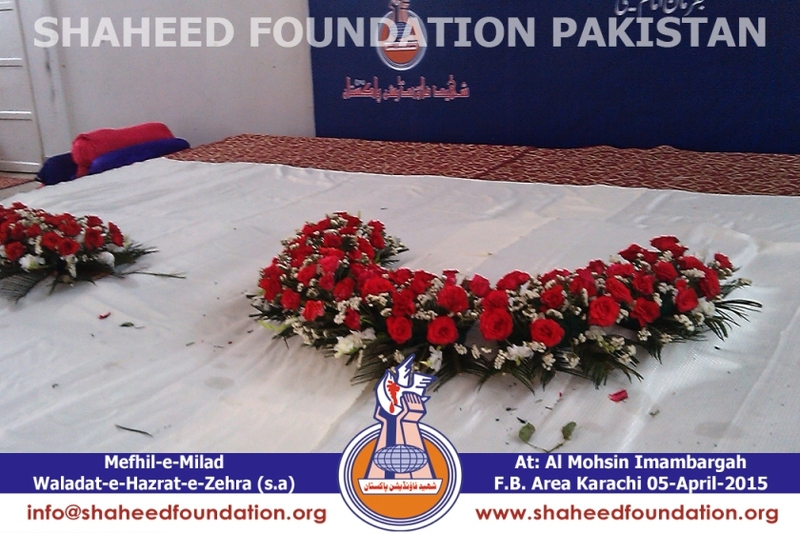 May Allaah grant us steadfastness on the path of martyrs and give us resilience to understand their message and act on its spirit till we join ranks with them.